If you have redecorated your bedroom and now your headboard no longer matches or if you just feel the need for a revamp or change, here’s how it can be done. Reupholstering headboards is a task that can be undertaken by the keen DIY upholsterer or if you would prefer we can do it for you. You have a buttoned headboard but want to change it to become plain. You have a plain headboard and would like to have it buttoned. You want a new headboard. 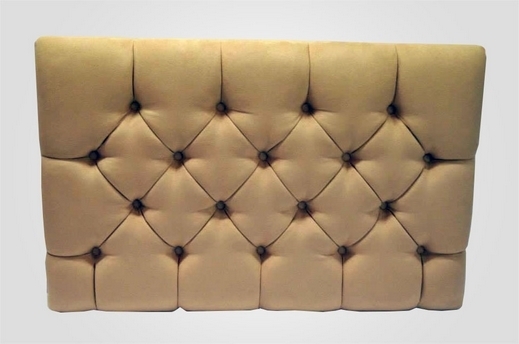 You would like to make a large headboard as seen on modern leather and suede beds. Remove the buttons and original cover. If you would like new foam for your head board we would recommend between 1.5” – 2” for this. 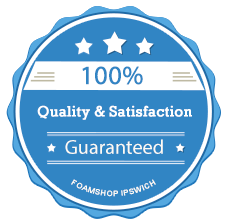 You can order the foam from our site. If you do not wish to purchase new foam, we would highly recommend you buy some 9oz polyester to cover the foam so you do not see the dips where the buttons used to go. Once you have secured this in place you can cover with your new fabric and cover the back with bottom cloth for the perfect finish. Remove your original cover and foam, and on the board mark out where you would like the buttons to go. The pattern and randomness of the buttons is entirely personal preference. We would recommend you use a 6mm drill bit when drilling the holes through. If you are doing the headboard yourself you can either make your buttons yourself using our DIY button maker or send in your fabric to us and we can make them for you. Once you have prepared the board you need to fit the foam and the polyester and then your new covering and secure. Then you need to get your buttoning needle (we recommend a 10”) and poke through from back to front to mark where your buttons are going to go. Then thread the button with nylon twine and thread through the needle. From the front you need to push the needle through the hole you have previously marked and make sure the nylon twine is visible from the back. If you lightly tack in the twine, you can adjust the depth of the buttons to the finish you would like, and then staple and tack in place fully. Finish with bottom cloth. If you would like to start a fresh and have a new headboard, that is a simple task. You will need to start off getting your board, and ordering your new foam and polyester. If you have opted for a shaped headboard we can cut the foam but we would need a template. If you are unsure at all you can contact us. You will need to fix your foam to the board and polyester on top. If you would like it buttoned you need to follow the directions for a buttoned headboard. Remember to finish off your headboard by fixing bottom cloth to the back. If you are trying to create a large headboard as seen on the large leather and suede beds, you need to opt for 3” thick foam and then we recommend finishing with 4-6oz polyester. Then complete as above. Tip: If you would like rounded edges to your headboard, you need to make sure the foam is an inch bigger all the way round so you can wrap it round the edges of your board. All of the sundry items you need to complete your project including spray adhesive and polyester wadding can be found in our online store, accessible from the home page. 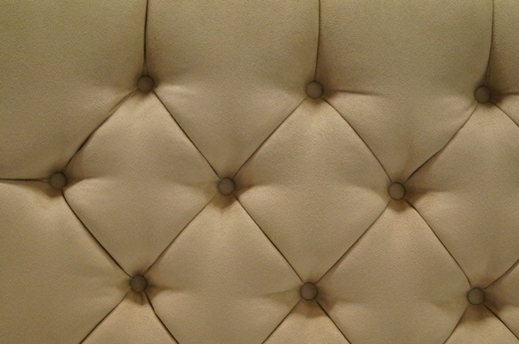 Example headboard we have refinished to be like new. If you're unsure of anything or just need some advice halfway through, click here to contact us, we’ll be happy to help..